I have made many works where I finished the concrete to look beautiful, smooth, light and inviting. In this work I wanted to return to the basic accepted wisdom of what concrete should look like  ugly, rough, heavy, and menacing. I also wanted to convey a sense of confinement for both personal reasons and for the national cultural / political climate. 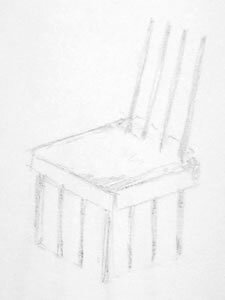 This object began as a chair but I quickly abandoned the back bars of the object so that the form would be closely aligned with the content. Another benefit of this decision was to crystallize the sculptural qualities and add ambiguities to the function of the piece. Is it a small table, hard stool, freestanding sculpture, or an element of a conceptual installation?